trendy ponytail hairstyles for long hair you can do at home! These easy ponytails are also packed with style and personality – plus gorgeous, and surprising, new hair color ideas. If you haven’t yet seen, ‘salmon-pink’, promoted from vintage-corsets to be the latest high-fashion hair color, you really shouldn’t miss this gallery. Come in and enjoy clever ponytails with maximum fashion impact from minimum effort! Here’s a great example of the saying, ‘work smart – not hard’! This simple design can be copied at home easily with two matching or contrasting ponytail clips. Clips that match your hair-color, like this copper band accentuating the copper highlights at the nape – add extra style! The triple blonde balayage and ombré in golden blonde shades really liven up light-brown hair. And all achieved on an everyday half-up style with an extra fastener added. How’s that for an easy, but trendy new look? This is a super-quick way to create a trendy ponytail on long hair or with a hair extension. This model’s medium-blonde hair is tied in a ponytail at the nape, with smooth hair around the head. The sides have been twisted and braided to make a lovely band of color and texture hidden by the fastener. The wavy ponytail can be lightly teased and tousled to add thickness and a contrasting, casual texture down the back. Pull down some loose tendrils to soften the profile and all done! Here’s a great idea for anyone who loves the individuality and casual style of a boho look! The color design of deep chocolate brown contrasting with peachy-pink look fabulous, because both colors come from the warm brown shades. There’s also a definite touch of black lowlights in the loose braid, which adds that 3-D depth we all love. The sides are loosely draw back and braided, with a very low-slung, tousled ponytail draped in defined waves down the back. Honey-blonde is a sensational color that’s just come back into fashion, after quite a long absence. I know that because I had a doll with honey-blonde hair, quite a few years ago! But this color design is new and super-attractive, with fine, light-beige highlights and ombré. The look is very soft and flattering to pale skin with warm undertones. The braid detail on this ponytail has thick, curvy links like a sophisticated chignon. But the low ponytail, spread out to display the delicate honey-beige ombré keep the look informal. 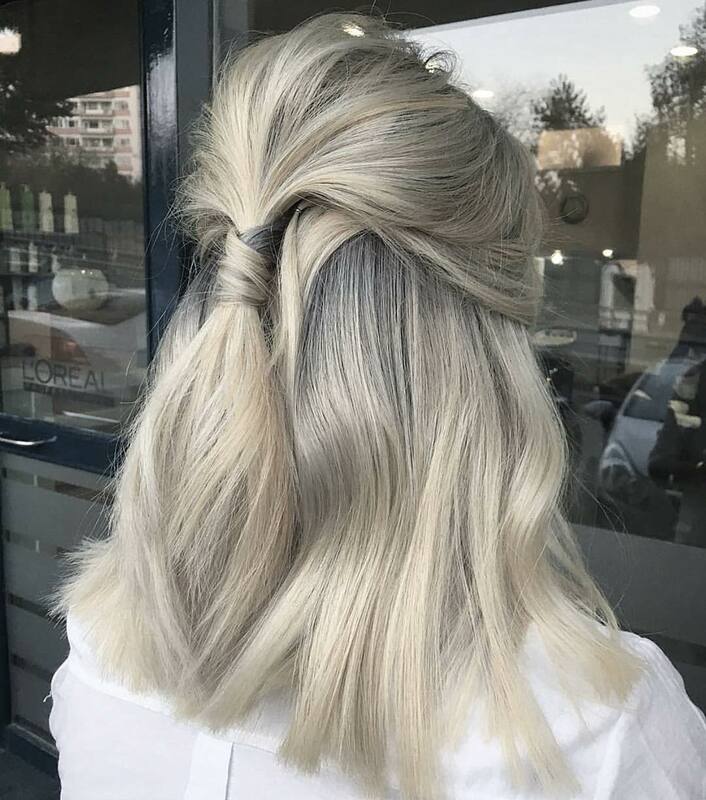 Depending on the your computer’s color settings this is a blonde style with graphite-gray or deep blue roots. Whichever you see, it’s a sophisticated look with a smooth finish and lots of well-groomed style! If you already have long white hair, adding gray or indigo blue roots is a great way to add some modern zing!, in a fairly subtle way. This is a good style for medium or fine-textured hair as blunt-cut ends make hair appear thicker. 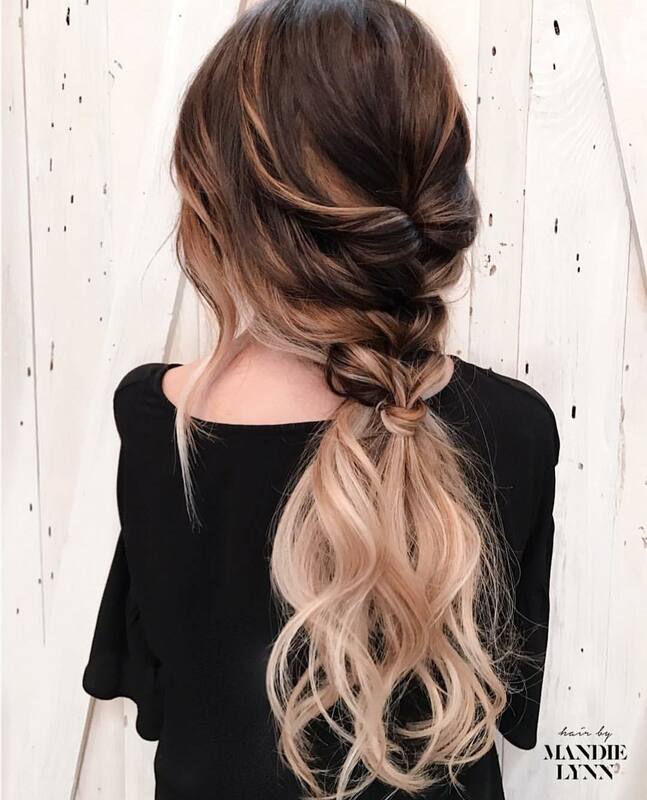 Gray- and beige-blonde strands hide the ponytail elastic with a pretty pattern on this attractive, natural look! I love this extra big, loose braid decorating the back of this trendy ponytail hairstyle! And it’s no co-incidence the model’s wearing a thick, cable-knit sweater, because that’s the inspiration for a fabulous new ponytail style. This style gains lots of extra movement from the ivory-blonde highlights running through the hair. 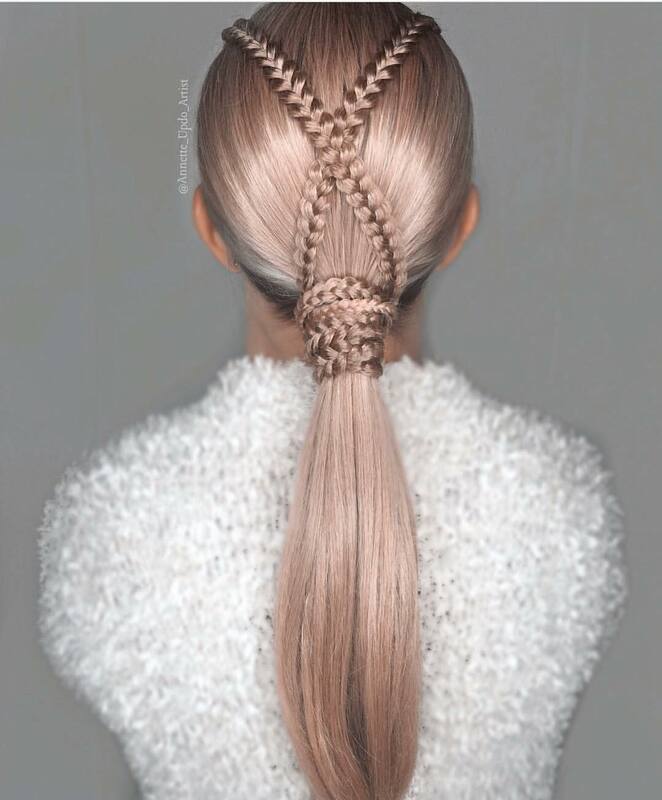 The dark-blonde roots create lots of 3-D texture against white blonde balayage in the braid. And with softly waved wide ponytail draped down from the nape, you’ll be as warm and fashionable as a panda when the temperatures drop! What a brilliant idea – anyone can make twists like this and wear a trendy ponytail hairstyle everyday! With 3 broad, twisted bands making a lovely V above the ponytail, this style has a fashionable new look about it. 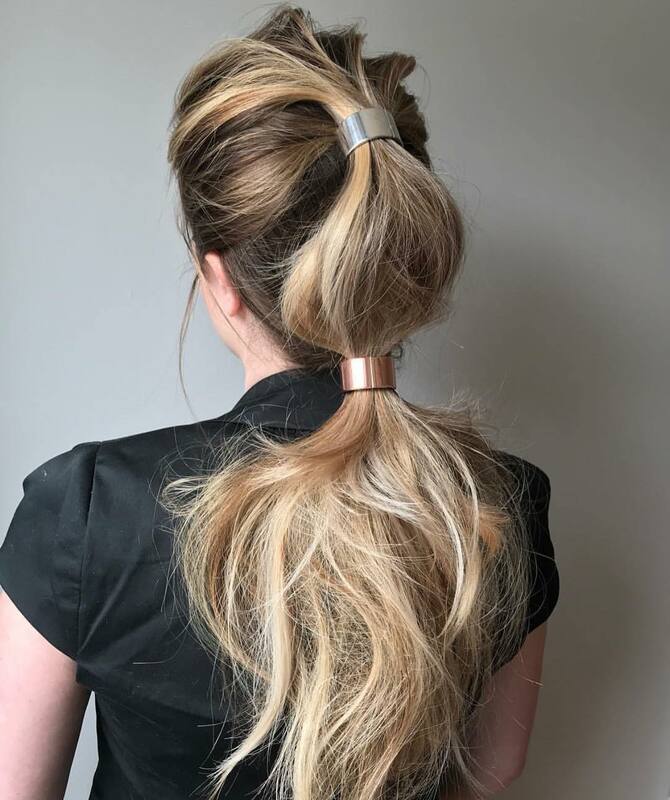 It’s a ‘messy’ ponytail style that’s designed to look casual, so the wispy silhouette and strands framing the face are all part of the design. And the model’s lovely, brunette hair has been lightly balayaged in fine, coppery-blonde to highlight the textures!